Earth Crew Students Complete Another Year of Exploration. Students at Poynter Elementary have had a successful year learning about how Science and Math are used at NASA to explore the Earth, the Solar System and the Universe. Activities this year included the NASA Design Challenge, planting basil seeds that flew in space, building a model of an end effector, and building and launching an air propelled rocket. I am so proud of the Earth Crew students who contributed to the success of our program. You are very responsible and that's what it takes to be a valuable member of any team. Thank you! 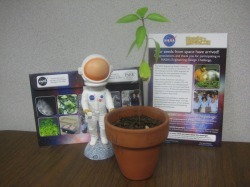 Click above to find out more information about the basil seeds that flew in space. Check out the lastest on our Plant Blog. November 7, 2007 - STS-120 safely landed at Kennedy Space Center with your signatures on board. The poster you signed has been returned to Poynter Elementary along with a photo of the astronaut crew that took your signatures to space and a NASA certificate verifying the signatures flew in space. Students signed the poster last spring on Space Day. That poster was digitized and signatures where included as part of the STS-120 payload. The poster will be displayed in the computer lab. Please stop by to see it. The poster shown on this page was given to first grade teacher Mrs. Pittman and her students. 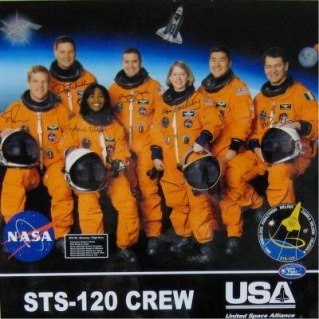 When the crew members of STS-120 learned our signatures were on their mission they autographed this poster for her students.